Yesterday I received this letter from one of our Biker Planet members and I just had to show it to you! I love my friends. My friends aren’t biker girls per se, instead they represent a varied swath of life, each having differing and unique occupations. We all respect one another, but we are girls and dishing out advice comes with the territory. When we talk about dating, I am always the oddest one out because my dating life now strictly revolves around biker guys. My friend Sarah has recently been dating an attorney and my friend Jill has been dating a personal fitness coach. Their weekend getaways usually consist of one of Scottsdale’s trendiest dinner affairs, some wine and then well, yes ladies, maybe his or her place for the “after.” You can imagine how my contribution of “did a day trip to Sturgis, I had my arms wrapped around his waist for hours, a wind blown body with a protector hovering the wheel into and away from the chaos of the world with a desert unfolding all around us,” goes over. I need to feel my inner wild child. That’s the tune I’ve been singing my whole life: cake and eat it too, then some more cake for eating. Biker guys make me feel free spirited and alive, rather than drab and socially contained for the sake of acceptance. I don’t want my guy to be predictable. I’ve dated plenty of non-biker guys and I always felt I was getting the same packaged doll, each and every time. Please don’t take this wrong, I am sure it was just the guys I was meeting, however that’s the relevant part of why I started dating biker guys in the first place. Before the Internet and places such as Biker Planet, meeting biker guys wasn’t the easiest so of course I tended to date a greater variety of “types,” but I always found the greatest connections with guys who rode. And the one thing I could always figure out in the equation was that the constant variable was that the biker guy always seemed less predictable. Maybe it’s the biker life that sometimes can feel a little bohemian, maybe it’s other less obvious reasons, but that’s how it always felt. I like to ride. So it only makes sense. I’ve been into motorcycles for over 15 years. I got my first tasted when I was 16 and my dad let me take a spin in his old Kawasaki Sportbike. That feeling of finally being so exposed to the elements while the wind whisked across my face was something I could never let go of. And so I didn’t. And while my bike selections have evolved since that hot August day with my dad, one thing that hasn’t changed is my undying love for motorcycles and the motorcycle culture. When you are looking for the perfect companion, wouldn’t you want that guy to be someone who shares the same sentiment for the thing you love most? I can see an argument both ways, but for me it is something I need and yearn for. So I love dating biker guys and meeting biker friends because well, I’m a biker. 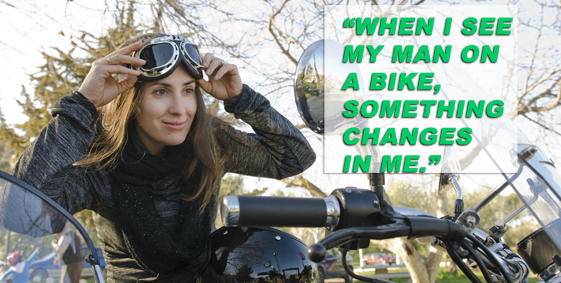 And while I’m a biker, I’m still a girl, ya’ know! When I see a man on a bike, something changes in me. That’s an odd thing to say, right? So non-descript and so vague. But really, isn’t that the “it” factor we all want in our dating lives? When a man steps off that powerful beast of a machine, removes his helmet and his hair blows in the wind and he puts that helmet against his hip, something…something I can’t define…something that makes my stomach flutter…something that makes my face feel warm….my world feel right…..happens.